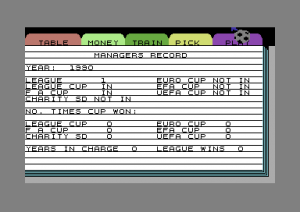 Kurt: Der Fußballmanager '99 is a managerial soccer simulation where the player coaches a team and is responsible for its athletic and financial success. In comparison to similar German games like Bundesliga Manager the financial part is driven back and the focus lies on the team. Nonetheless there are multiple financial aspects to pay attention to: Sponsorships, entrance fees, expanding the stadium, stock trading and of course buying and selling players. 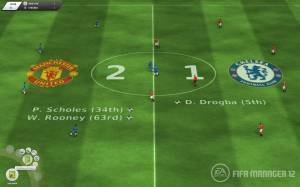 The game has two features which are a contrast to other games of its time: the menu and the match presentation. 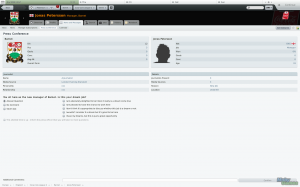 In the menus where the player sets things like training or lineup are practically no numbers - each number is represented by a graphical presentation. This is especially remarkable because the players have many attributes including uncommon ones like nerves strength. The menus have a comic look with mascot Kurt, a young boy, and can be freely arranged in the menu bar. The matches are calculated and displayed in real-time. The player has a lot of tactical possibilities during the game like substituting players or even change the tactic completely. These changes are directly visible in the match presentation. In contrast to the Championship Manager series, which has a similar premise, the match is shown in an isometric perspective. Not only the own game is calculated in real-time, all parallel matches are too. The player has even the possibility to arrange windows of varied size on the monitor where he can follow them - or switch completely to another match.